Nachni or red millet is widely grown as a cereal in the arid areas of Africa and Asia. It's also known as finger millet, which has been cultivated in India from as long as 4,000 years ago. In fact, the Indian states of Karnataka, Andhra Pradesh, Tamil Nadu, Bihar and Maharashtra produce Nachni. Karnataka is the top producer of Nachni and has 58% share in India's export of this crop. As a crop and after harvesting, Nachni keeps extremely well and is seldom attacked by pests. This eliminates the need for chemical fertilisers and pesticides, making it a safe food. It is also a cost-effective source of protein, iron, calcium and fiber, which makes it the preferred food of many communities. Notably, it's a rare source of the amino acid. The whole grain of Nachni may be ground into flour or decorticated before grinding to produce either a fine particle product or flour, which is then used in various traditional foods. The flour may be ground coarsely or finely, depending on individual preference and as per the recipe. Nachni Ladoos are common in some families. Nachni is prescribed to the mothers that wish to increase the quantity of milk produced for their baby. In Maharashtra, bhakri, a type of flat bread is also prepared using finger millet (ragi) flour. Here is one recipe you can try with nachni. 1. In a pan, add red millet flour and dry roast it. 2. In a bowl add curd, water, salt and whisk well. 3. In another pan add oil, chopped green chillies and fry them. Remove few fried green chillies and keep aside. 4. Now add chopped ginger, spring onion, carrot, nachni flour, curd mixture, water, salt in a same pan, mix well and let it cook. Add french beans. 5. For the lassi, in a blender, add popcorn, curd, sugar, water and blend. 6. Garnish the dish with raw mango, fried green chillies, sesame seeds, roasted cumin powder and popcorn. 7. 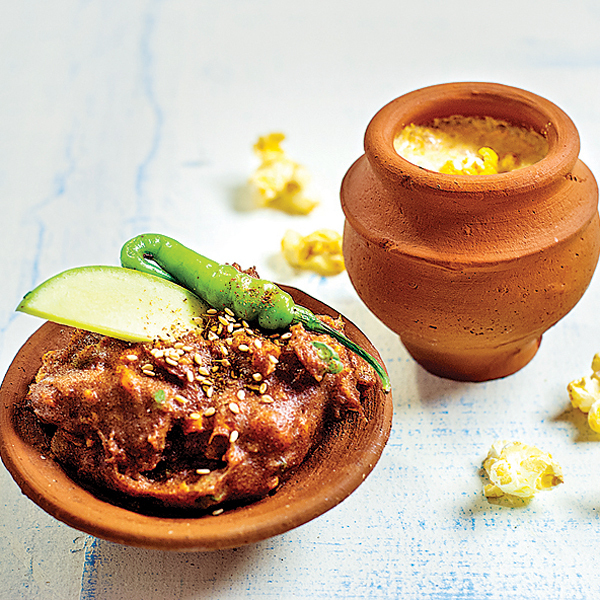 Serve the dish with popcorn lassi.